When you make the decision to reserve a limousine, you expect a superior ride with a generous touch of class. Crown Limousine delivers just that. We provide you with safe, elegant, and excellent limo service throughout your special day. Crown Limousine is dedicated to getting you there on time, and making any event, or wine tour truly memorable! Paso Robles, Atascadero, Templeton, Cambria, Cayucos, Morro Bay, San Luis Obispo, Edna Valley, Pismo Beach, Arroyo Grande, Avila Beach, Pozo, Santa Margarita, Shandon, Paso Robles Wine Country, San Miguel and the entire Central Coast. Take the whole gang in the Party Bus! "Our visit to Paso Robles wasnt fulfilled until we traveled to several wineries with Crown Limousine. We appreciated the prompt arrival, dedicated service, and the professional courtesy that their driver provided. The area is great, and would love to come back to the area. Thanks again Crown Limousine for making our business trip to California a memorable one!" I used Crown Limo for my friend's Bachlorette Party wine tasting day in Paso. Let me just say that I was extremely impressed with the service that we got from Crown Limo. Our driver was AMAZING. Not only was he polite, respectful, and sweet but he walked into every winery we went to to check us in, he would collect our purchased bottle of wine, label them and put them in the bus. He was responsible in that he kept us on schedule but not in an intrusive way. He made sure everyone was comfortable, had water for us ready to go, and just gave us GREAT service. I highly recommend them if you are looking for a safe ride around Paso! Thank you for such great service! "7 of my friends and I went on a wine tour and I have to say it was the best experience I've had thus far. Dan picked us up promptly and was very personable and made us feel very comfortable. He was informative as well as being a down to earth man to spend the day with. As for the wineries, it was so surreal to see the atmospheres that each winery had to offer, all different personalities and I learned something new with every glass. If it's one thing you want while wine tasting, it's letting yourself be able to enjoy the wines with out the stress of driving, and that's why I highly recommend this service to you!" "Crown limo has been my go-to when I'm hosting friends for a weekend. I have used them several times for wine/beer/vodka tours and have requested Dan the man every time as our driver. He's very entertaining and professional and gets us in to all the best private tastings. Crown Limo is the best in the Paso Robles area and the most knowledgable. Thanks crown limo- see ya'll soon!" I cannot say enough good things about Crown Limo and Wine Tours. 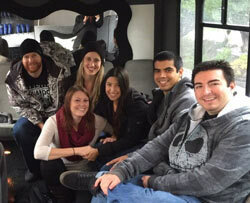 I booked their party bus for a bachelorette party wine tasting tour and it was such a simple and easy process. Brent took care of calling all of the wineries ahead of time, gave great recommendations and was really prompt in returning phone calls. Nick was our driver and he did such a wonderful job! They provided water during the trip, he helped set up our lunch that we brought. We all had such a fun and memorable time and I will definitely be recommending and using Crown in the future!